Where to find San Sebastian hotels near an airport? How can I find hotels in different San Sebastian neighborhoods? Where can I find hotels in San Sebastian that are near tourist attractions? From the budget level to the more exclusive, San Sebastian features a broad selection of great room choices. 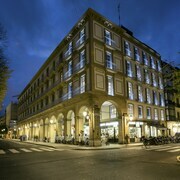 Approximately 52 accommodations can be found within a 0.1-kilometre (0.06-mile) radius of San Sebastian's downtown area. Within 1 kilometre (0.6 miles) of San Sebastian's center, travelers can find a selection of Expedia-listed accommodations, including the Hotel Maria Cristina, a Luxury Collection Hotel and Hotel de Londres y de Inglaterra. With 5 Expedia-listed hotel establishments Irun is the neighborhood with the biggest selection of San Sebastian accommodations. Irun is around 15 kilometres (10 miles) from downtown. Irun hotels include the Hotel Alcazar and Hotel Urdanibia Park. Hondarribia, Zarautz and Oiartzun are three other San Sebastian areas that offer Expedia-listed hotels. In Hondarribia, the hotel selection includes the Parador de Hondarribia and Hotel Río Bidasoa. Alternatively, those who would rather to base themselves in Zarautz, should check out the Talaimendi and Hotel Zarauz. In Oiartzun you can take your choice between Hotel Restaurante Usategieta and Casa Rural Olazi. For those who are arranging a trip to San Sebastian so you can see the Monte Urgull, the Concha Beach or the Monte Igeldo, why not book a hotel nearby? The TRYP San Sebastian Orly Hotel as well as the Astoria7 are close to the Monte Urgull. 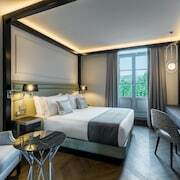 While the TRYP San Sebastian Orly Hotel is 0.9 kilometres (0.6 miles) from the Monte Urgull, the Astoria7 is 0.9 kilometres (0.6 miles) away. The Rusticae Villa Soro is 2 kilometres (1 mile) away from from the Concha Beach. The NH Collection San Sebastián Aránzazu is also situated easy walking distance. The Hotel San Sebastian and the Husa Europa are convenient accommodation options if you want to stay near the Monte Igeldo. The Hotel San Sebastian is 0.9 kilometres (0.6 miles) away and 2 kilometres (1 mile) is Husa Europa away. Thrifty travelers rejoice! San Sebastian offers a good selection of low-cost hotel options. 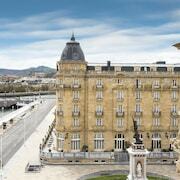 3 kilometres (2 miles) away from San Sebastian's downtown is where you'll find the Hotel Donosti. The Hotel Palacio de Aiete is only 2 kilometres (1 mile) away. Alternative affordable hotels are the Hotel K10 and the Green Nest Hostel Uba Aterpetxea. 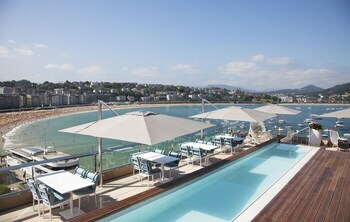 17 kilometres (10 miles) from the center of San Sebastian, is the Serge Blanco Thalasso & Spa. The Hotel Jaizkibel is situated 16 kilometres (10 miles) away. Alternatively you could book a bed at the Hotel Iriarte Jauregia or the Hotel Arrizul Center. Looking to travel a bit further afield? Basque Country offers many attractions. Investigate Basque Country's old towns, historic bridges and churches and also photograph the region's rural landscapes, beaches and coastal plains. In this region of Spain tourists may also enjoy mountain climbing, hiking and horse riding. Bilbao is 75 kilometres (48 miles) to the west of San Sebastian and is home to the Guggenheim Museum Bilbao and Santiago Cathedral. 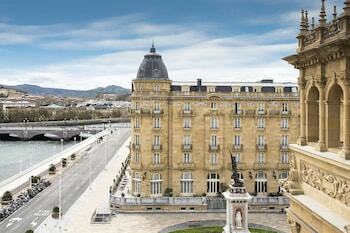 Bilbao hotels and accommodations are the Gran Hotel Domine Bilbao and Hotel Miro. 0.3 kilometres (0.2 miles) to the west of San Sebastian, you'll also find Old Town, home to the Barceló Costa Vasca and Hotel Silken Amara Plaza. If you're staying in Old Town, be sure to explore the Goikoa Palace and Basilica of Saint Mary of Coro. If you are traveling into or out of San Sebastian Airport and are looking to stay nearby try Résidence Sokoburu or Résidence Vacances Bleues Orhoitza. 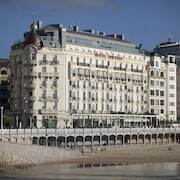 What are the most popular San Sebastian hotels? Are there hotels in other cities near San Sebastian? 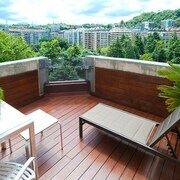 What other types of accommodations are available in San Sebastian? Explore San Sebastian with Expedia.ca’s Travel Guides to find the best flights, cars, holiday packages and more!